A website designed using Responsive Web Design framework is able to adapt to different screen sizes and devices, to provide an optimized viewing and interactive experience on each. Over the last couple of years, Responsive Web Design has become a mainstream, device agnostic approach to delivering content to users. Why should Higher Education institutions be concerned? According to research from Higher Education Consultants Noel-Levitz, 68 percent of college applicants have viewed college websites on mobile devices. And if a college's website isn't optimized for mobile, these potential students drop off. Many higher education institutions have been quick to implement Responsive Web Design, embracing the benefits such as unified end user experience, reduced maintenance efforts, and efficient Search Engine Optimization among others. Orbees works with institutions to create digital assets that communicate their messages across all devices. 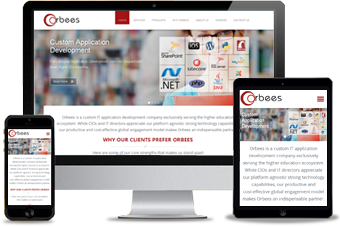 What makes Orbees' Responsive Web Design Better? Our websites are device agnostic, which means your users have a unique experience no matter what device they use. We use a fluidic grid that adjusts itself based on the device specifications. This helps us future proof your website. Orbees follows industry best practices as outlined by the World Wide Web Consortium. Our adherence to the best practices results in longevity and increased interchangeability across all of our applications and websites.